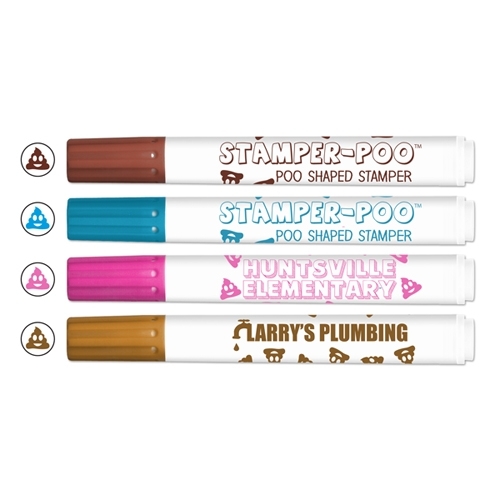 Everyone's favorite emoji - now at your finger tips with our new Stamper-Poos™ Poop Emoji Washable Ink Stamping Markers!!! Don't be afraid to express yourself! Our Stamper-Poos™ are made with washable inks for easy clean up, so they'll wash easily off skin and most fabrics. Stamper-Poos™ are safe too! They conform to ASTM-D 4236, they're Non-Toxic, and best of all they're UNSCENTED!!! Color of Cap matches Color of Poop. Packaging: Bulk 300 @ 10 lbs. Minimum: 100 per Poop Color.